Splicing wire allows for ultimate customization in light installations by creating custom lengths to fit specific areas. Splicing is most simply defined as the cutting and joining of two separate wire pieces. While splicing may seem like a complicated approach to decorating, it is actually a quite easy when performed with the proper tools and technique. Use the images and step by step instructions below to help ensure an easy wire splicing experience every time! There are several reasons for splicing, but the most common is that the wire needs to fit a certain area with very specific measurements. Splicing wire after measuring the area obtains the most professional look rivaling even an installer's work. Splicing means wires do not hang or sag when used with a combination of clips, creating clean lines and even bulb spacing. Another common reason for splicing is to avoid exceeding amperage. Using a long string with too many bulbs can blow fuses, so splicing wire for shorter strings with a smaller bulb count can avoid a blow. Remember, when splicing, the amperage for the run is that of the section plugged into the wall. For instance, if a 5 Amp wire is plugged into the wall, and two additional 5 Amp strings are plugged end to end, all three strings still share the same 5 Amp capacity. They do not combine to make 15 Amps. For more information on amperage, visit the Christmas lights power consumption page to calculate how much power your lights will be using. Make sure the electrical wire is unplugged from any power sources before attempting the following instructions. Inspect all wiring and accessories to ensure that wire insulation matches for all electrical components being connected. Popular wire insulations are SPT1 and SPT2. This refers to the thickness of the insulation surrounding the wire. Most wire and zip plugs are either SPT1 or SPT2, and you should not use SPT1 and SPT2 products together. For polarization, make sure the white writing on the wire is pierced by corresponding prongs. 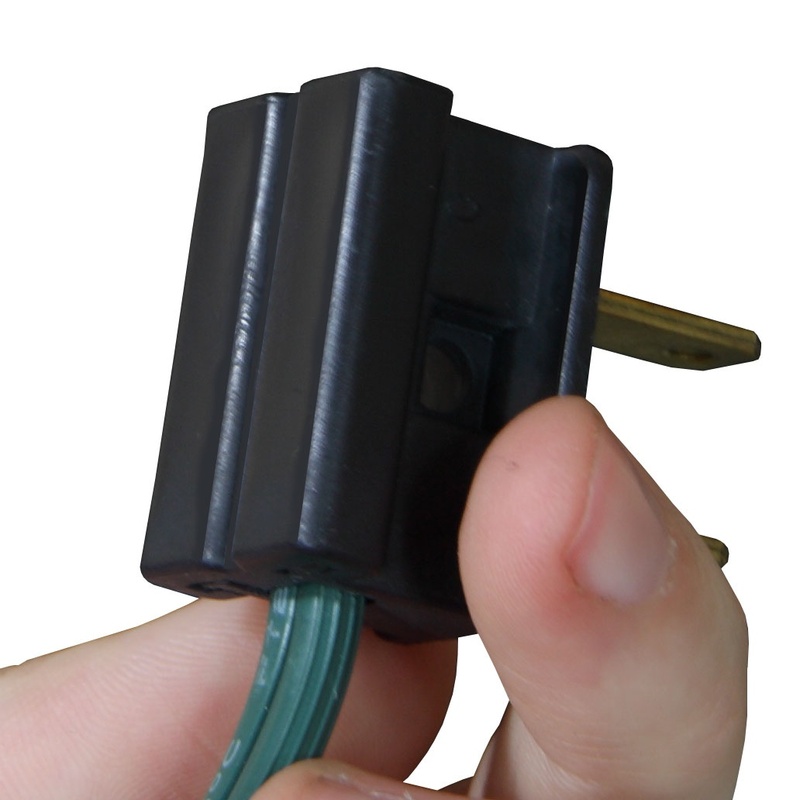 If the side of the wire with white writing goes into the male zip plug on the side of the larger prong, the white side of the wire must also go into the female zip plug on the side of the larger prong. When the zip plug has been properly installed, the golden metal teeth within the zip plug puncture the wire and complete the circuit. C7 Spools and C9 Spools are most recommended for splicing and come in 1000 ft lengths. They can be cut anywhere so long as the zip plug can attach to complete the circuit, so avoid cutting too close to a socket. 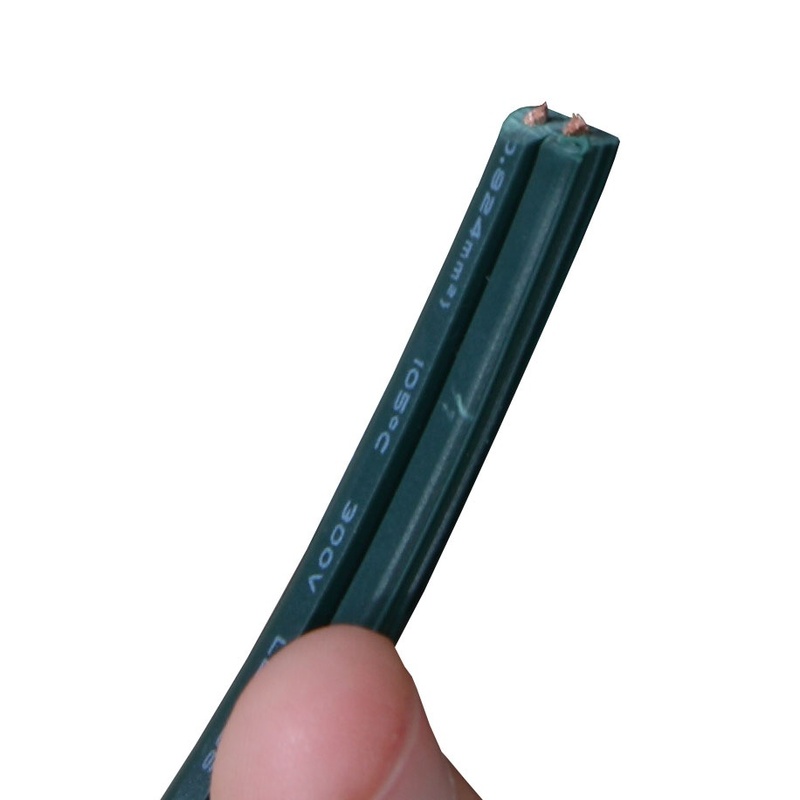 Bulk wire is available in two types, SPT1 and SPT2. This refers to the gauge, or thickness, of the wire. 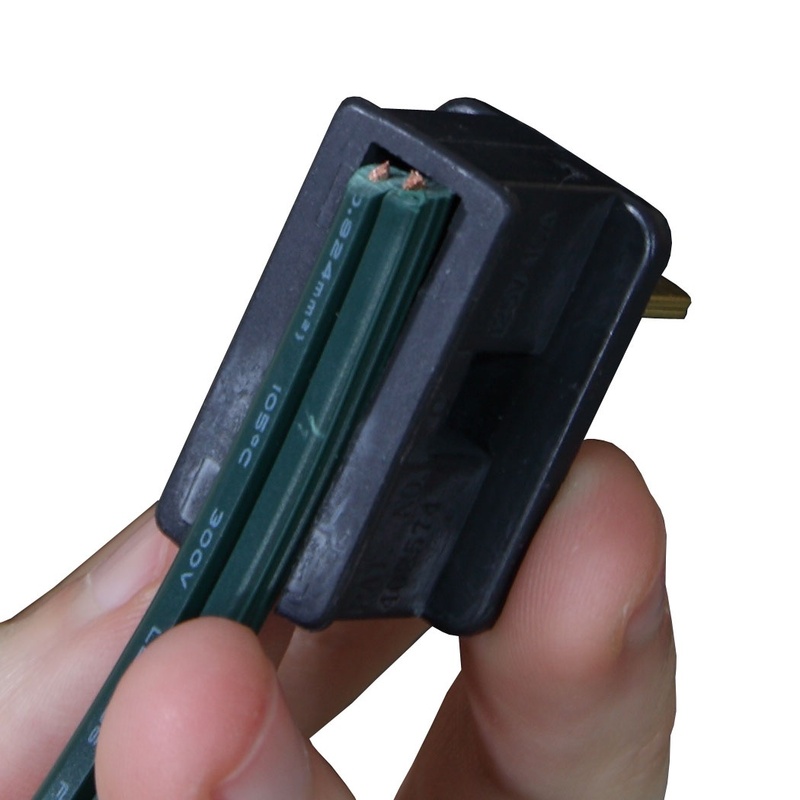 Bulk wire is typically used for custom length extension cords or to connect sections where bulbs are not needed or desired. 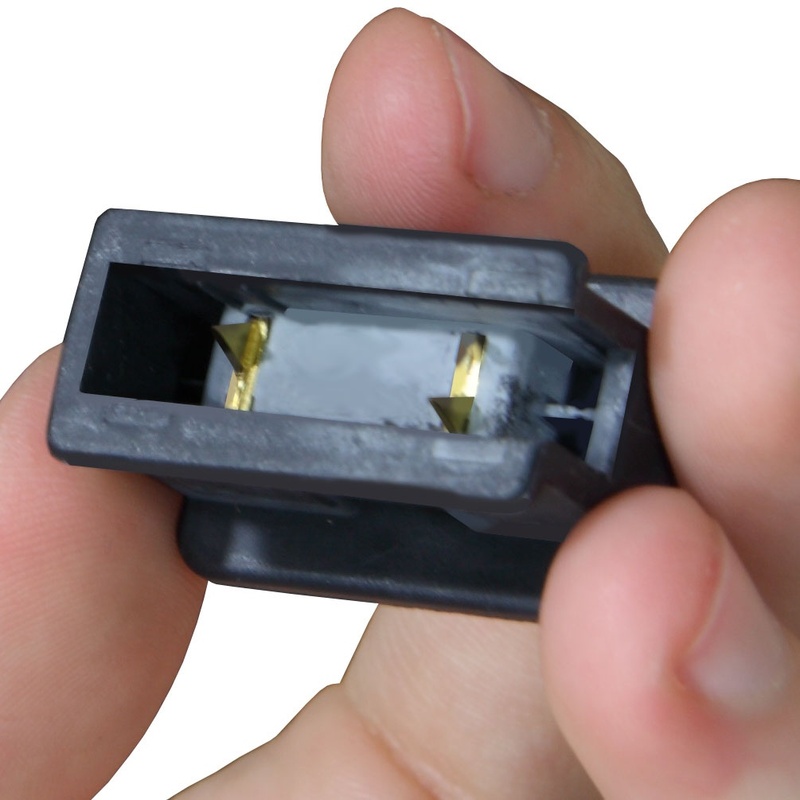 When completing the circuit with zip plugs, make sure your wire and zip plugs are either SPT1 or SPT2. Do not mix SPT1 and SPT2 products.